What's In My Bag | La Petite Noob | A Toronto-Based Fashion and Lifestyle Blog. It's time to admit to a guilty pleasure - I am absolutely addicted to seeing what's in people's bags; wether it be a youtube video, or a blog post - I'm all over it. I'm a pretty nosey person by nature, so being able to see what girls carry in their most sacred of objects - their bags - gives me a tickle like no other! I decided to participate in the huge internet trend, and hopefully give you some insight into the question that I'm sure has been just burning at you since reading this post - what's in Joëlle's bag. This Marc by Marc Jacobs shoulder bag is my go-to for spring and summer. The colour has since been discontinued, but the brand seems to come out with similar colours (if not with a slight variation) every season. I have a lot of Marc by Marc Jacobs purses and, while I really should start branching out, I don't think you can find much better quality for the price point. The leather is so soft and malleable, achieving the perfect slouchy look. My only complaint is that the brand does make a very heavy bag, so I try hard not to over fill it. I really love these sunglasses. Ever since purchasing them last summer, I've barely taken them off my face - making all my other pairs of sunglasses feel sad and neglected. The shape is interesting enough to have a bit of edge, but from afar they look like the perfect, slightly cat-eyed sunnies. This is my first pair of Karen Walker sunglasses, but surely won't be my last. I absolutely hate the rain. Few things give me as much misery as getting caught in a freak rain shower without an umbrella - hence why I carry an umbrella with me everywhere I go. The pink and white polka dot pattern is almost cute enough to make me forget about the rain when I use it - almost. This item really goes without saying - Mama's gotta stay fresh. I carry around a pair of glasses with a very slight prescription to help me see while driving in the dark. The prescription is so low that getting glasses was deemed as 'optional' from my optometrist - but I wanted a pair of glasses so badly so here they are. I use them less from driving, and more at work when I want to feel smart. My purse is honestly exploding with bobby pins. I still have no idea how they keep on accumulating, but it seems as thought that every time I clean them out, they seem to replenish almost instantaneously. I, along with most other women, have at any given time anywhere from 5 to 10 lip products in my bag. The number steadily climbs as I toss whichever lipstick or lipgloss that I am wearing for the day in my bag, and never remember to take it out. So there you have it - everything that is in my bag. Hopefully this will inspire someone to create their own 'what's in my bag' post - I'll be creeping. I love nosing around other peoples' bags too! It truly is a guilty pleasure that can't be explained. Also, the spontaneous regeneration of bobby pins - totally a thing. I am exactly the same as #6. I always carry my low-prescription glasses around just in case I actually want to put them on for driving. But I usually just wear them at work so I appear smarter. I am so glad you wrote that Lexi - I am not alone in the borderline-fake glasses for added intellectual points! I would love to switch my bag everyday, but usually laziness sets in when I think about switching everything over lol. 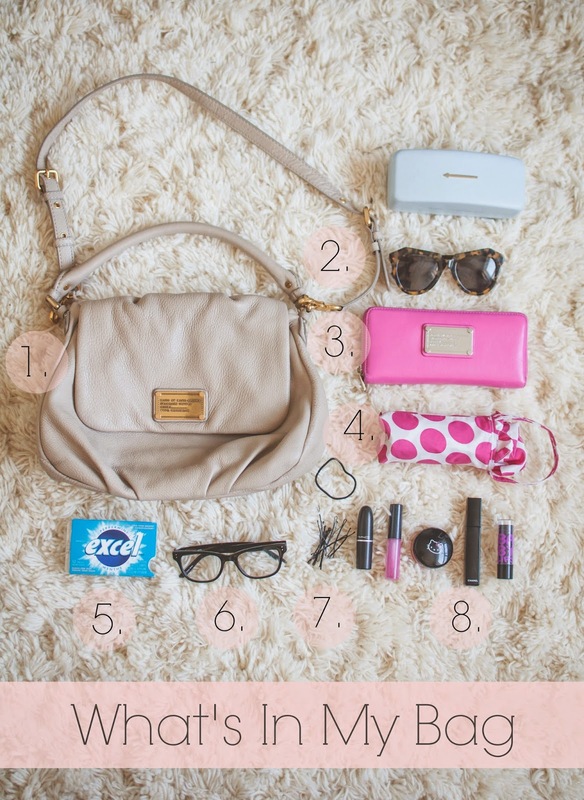 You must have incredibly tidy purses with all the change! & Thanks for your lovely helpfull posts! If you don't mind me asking, what color exactly is your bag? I know it's a discontinued color but they all look so different depending on the particular photo, lighting, editing, etc. I'm almost positive the colour is 'Taupe.' Hope that helps! Love the 'whats in my bag' posts too! Thanks for sharing :) Us curious folk appreciate it!!! Haha! From one curious folk to the next - you're welcome!